Unfortunately, the trade show is not open to the public. I was able to go because I work in a health food store. I was there to network for the store but I ended up getting a chance to network for the Website, Facebook Page and Blog as well! Some are new gluten-free products to Canada, some are just new to me or rediscovered. I'd like to apologize for the crappy pictures. I used my iPod and well, the quality isn't too great. First up, Martin's Marvelous Naturals. The crisps and granola come in a variety of flavours and use certified pure, uncontaminated oats. 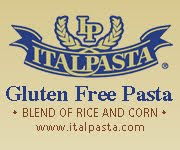 They are made in a completely gluten-free facility and are certified gluten-free in the US. Due to Canadian label laws, in Canada they are called "wheat, rye, barley-free." Mapleton's Organics ice cream is gluten-free! They even have seasonal flavours - Pumpkin for Fall, Candy Cane at Christmas time and Dandelion in the Spring. NEW! 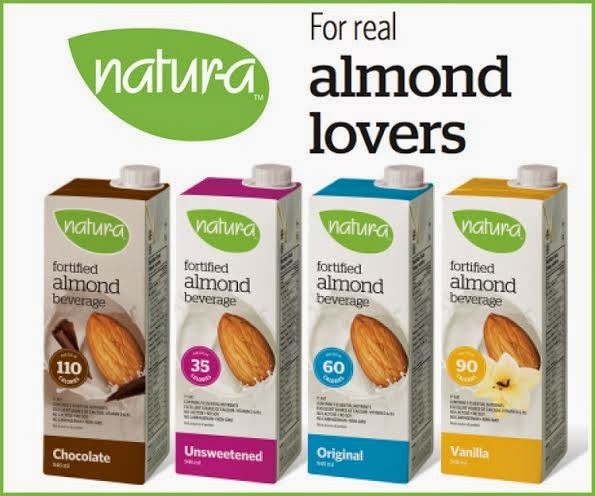 Natur-a will soon be introducing gluten-free almond milk! And it is enriched with vitamins, too. Yum! Should be available in November 2011. NEW! Kinnikinnick offers gluten-free pie crusts! Some more Kinnikinnick products - yummy cookies! Ginger, Chocolate Chip, Kinni-Toos in vanilla and chocolate, plus Graham Crackers for S'mores! NEW! Kinnikinnick will soon be introducing these new Thin Crust Pizza Crusts! Available in packages of two. Sol Cuisine gluten-free veggie burgers - always a favourite of mine! This new packaging coming to stores soon. NEW! GlutenFreeda's is introducing these new Pizza Wraps! NEW! GlutenFreeda's cheesecake will be available in three flavours - New York Style, Chocolate and Strawberry. Finally someone posed for me! O'Doughs gluten-free products truly are great. Pizza crust (with handy tomato sauce packets), muffins, buns and bread. NEW! Remember last month when I raved about gluten-free perogies I got in Buffalo? They're coming, baby!! 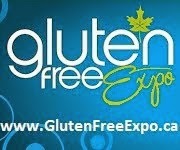 Conte's gluten-free products should be available in Ontario in November/December 2011. Line up includes gluten-free perogies, ravioli, gnocchi and pizza! Zevia is a sugar-free, gluten-free soda. Food Should Taste Good offers a wide range of gluten-free tortilla chips, in some non-traditional flavours. Enjoy Life products are free of the top allergens - they have bars, cookies, chocolate chips, granola (no oats) and trail mix. Some more Enjoy Life products! Peg stand of gluten-free Prana products. Cavena is an oat product made with pure, uncontaminated oats. 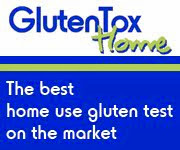 They are tested and repeatedly show under 5PPM of gluten (the lowest level detectable). 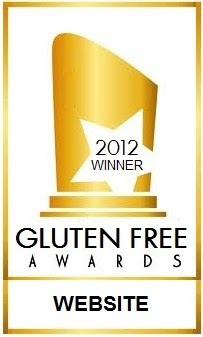 I was even given the test results to show the undetectable gluten. It cooks up like rice and their website offers a lot of recipes. The Simply Bar contacted me via Twitter and asked me to stop by. I got these samples of their gluten-free, vegan, low-glycemic bars to try out. Rizopia gluten-free pasta - rice and wild rice in different shapes. Nancy's - yogurt available in cultured soy (dairy-free) and dairy, with probiotics. They also have cottage cheese and cream cheese. Kind bars - made with nuts and fruit. JYOTi has homestyle canned Indian dishes. All of their products are gluten-free! Namaste is a popular line of gluten-free mixes. Purely Bulk gluten-free mixes - the banana bread is amazing! My friends didn't believe the banana muffins were gluten-free. 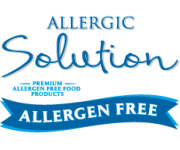 Allergic Solution is a local product from the GTA. Available mixes - egg bread, egg-free bread, pancake & waffle, vanilla cake, carob cake and muffin mix. I got a sample of the pancake & waffle mix and can't wait to try it out! Review coming soon. Tons of raw food that is also gluten-free. Lucy's Cookies are made with certified pure, uncontaminated oats. MimicCreme products are dairy-free cream alternatives for coffee and in your favourite recipes. Made with cashews and almonds. They even have a non-dairy whipping cream! This new packaging will be out soon. Barkat products and Pastariso products. Gluten-Free Gingerbread House Kit available from El Peto!! Sounds like fun. 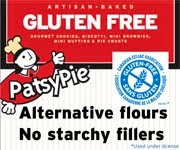 Patsy Pie gluten-free products - muffins, cookies and biscotti. NEW! Not even on their website yet - Patsy Pie gluten-free pie crust! PaneRiso products - one of the first companies to come out with gluten-free products in Canada. NEW! Gluten-free macaroons from Mrs Crimbles. NEW! Mrs Crimbles gluten-free crackers and "bites" - like puffed crackers. StarLite Soy Taquitos are vegan and gluten-free. Gluten-free Blue Diamond Nut-Thins - crackers made with nuts and rice flour. Different flavours available. Pamela's Products offers ready made snacks and gluten-free mixes. San-J offers a nice range of gluten-free tamari sauce and Asian cooking sauces. NEW! Stickling's Bakery gluten-free bread crumbs and croutons. They also make a large pizza crust and they are coming out with an individual size crust, too. Wholesome Sweeteners organic sugar. Made in a dedicated gluten-free facility. NEW! Gillian's gluten-free breads, buns, croutons and cookie dough. I sampled the cinnamon raisin bun - wow! Very fluffy. Always a favourite - Udi's gluten-free products. Best bread around. 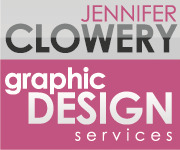 They will have new products coming to Canada in 2012! Not pictured... but they include brownie bites, omega flax fiber bread, frozen pizzas - (margherita, cheese and pepperoni) and fortified muffin tops! NEW! 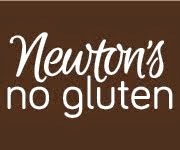 GAGA for Gluten-Free products are made in a dedicated gluten-free facility and available in chocolate chip, chocolate chocolate chip and shortbread. 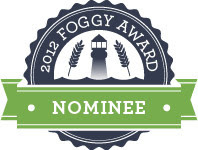 So there it is, GFO readers. 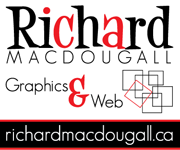 Lots of new stuff coming to Canada and it was SO nice to see hundreds of products out there and meet the wonderful people behind the labels. What I didn't post was the massive amount of samples I ate while at the show. I learned last year to go on an empty stomach because there is truly enough food for breakfast AND lunch. Fantastic! Wish I was there to see first hand but your pictures where great. 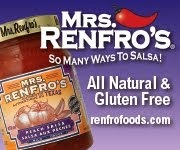 Lets hope all the grocery stores bring on at least some of these products. There are people with "food issues" everywhere!!! Great job giving us an inside look. Wow! Thanks Jax for all of this - some REALLY exciting stuff coming up Yay! Wow! thanks so much Jax! I e-mailed El Peto regarding theGF Gingerbread House Kit when you posted this blog. No response yet =( Have you had any luck?